The name of these says it all–wow! We found these cookies recently at Whole Foods, and loved them! Definitely ones to try. While you can find a lot of gf cookies these days, rare do you find soft, chewy ones. 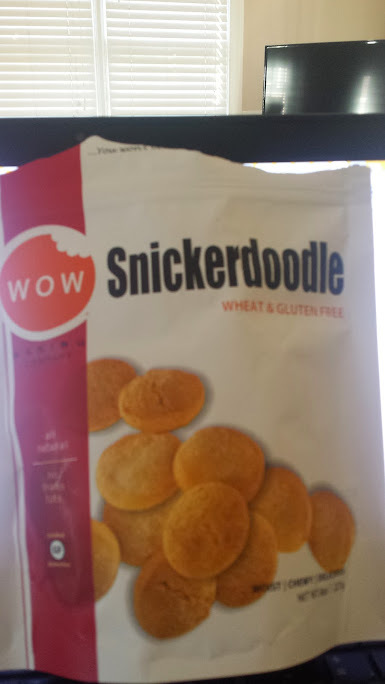 That is just what you find wiht Wow Snickerdoodles! You can find more about Wow here (http://www.wowbaking.com/). When browsing through their site, you can see their commitment to gluten free, or more certified gluten free foods. A nice variety of products, from tubs of cookie dough, to individual packs of cookies, to a variety of baking mixes (spiced cake, yum!). Another great find, and a company to check out!